You either love it, or hate it. I absolutely love everything coconut. If there is a table full of sweets and I can't decide what to get, if something is made with coconut, it will make everything a lot easier. That is the dessert for me. 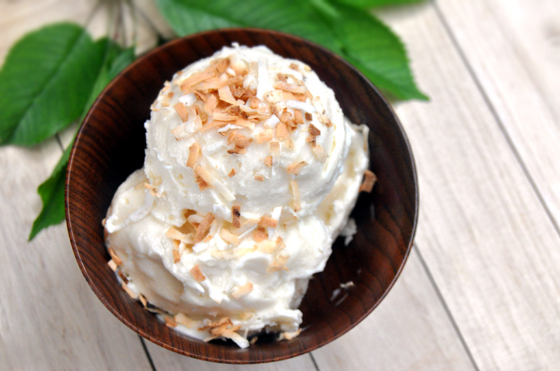 What made me decide to make a coconut treat was a frozen yogurt that I had recently at one of those local frozen yogurt places. It was so good, I think I didn't even put any toppings on. And that says something, because they have like 3 miles worth of toppings in that place. Every candy bar, dried or fresh fruit and chocolate type imaginable. They have everything. And when we go, my son gets everything. He starts with regular M&M's, goes over the chocolate chips, gummy bears and then sometime, about half an hour later, we top it of with some fresh blueberries and marshmallow sauce. Why not. He is three. We almost never do it. And it's worth the expression on his face. So worth it. 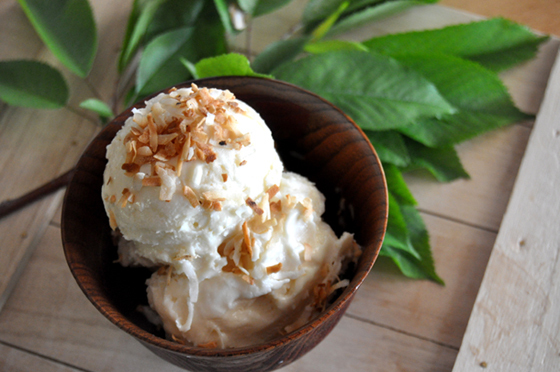 So to get back to my coconut ice cream. I was looking for something real easy to start my frozen treats season, and when I found this recipe on wonderfuljoyahead I decided that it just doesn't get any simpler than that. I even had everything already waiting for me in my pantry. This was a no brainer. Whisk all of the wet ingredients in a medium bowl to combine. If you have time, refrigerate the bowl for 30 minutes to chill the ingredients. Stir again, and with the ice cream maker turned on, pour all except for 1/2 cup into the freezer bowl. 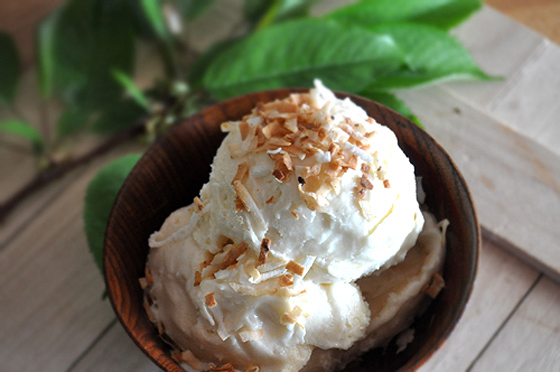 Churn for 5-10 minutes and then add a big handful of coconut. 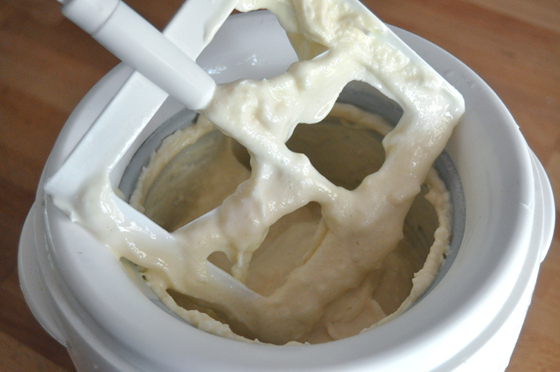 Churn for another 10 minutes or until the ice cream is soft serve consistency. Pour and scrape contents into a freezer safe 1 1/2 quart container with lid. Or, use a large container with wax paper placed directly on top of the ice cream to prevent ice crystals from forming. Freeze for 3 hours, or until your desired consistency. When ready to serve, let the ice cream sit at room temperature for 5 to 10 minutes to make it easier to scoop. Top with chopped up chocolate fudge and toasted coconut. 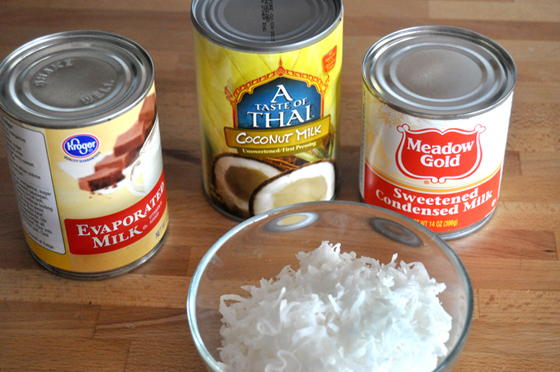 Don't skip the toasted coconut, that is the best part. I made mine in a non stick pan on the stove top. I just put a thin layer of it in the pan and turned the heat all the way down. 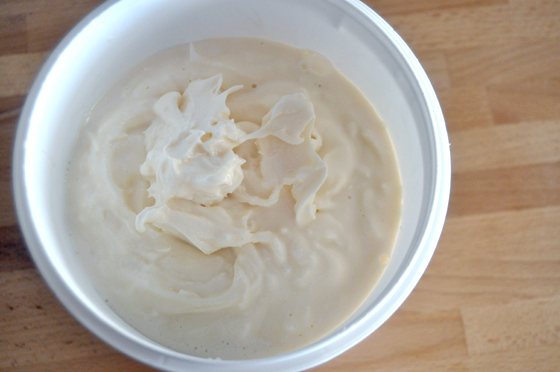 You have to stir it occasionally and have some patience, but it is the best part of this ice cream. All in all, this is a quick and easy treat to make. The taste is great, but I missed that little kick of acidity that you get in the frozen yogurt, so next time I'm making this I will switch up a few things and add some yogurt. I think I will be doing this soon because this ice cream is already gone! I love using coco milk, drinking fresh coconut juice and just like you, for me coconut is truly special! 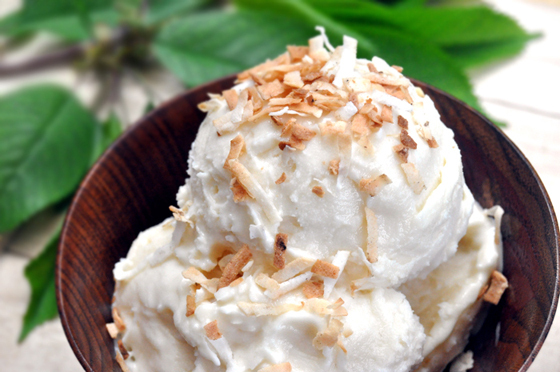 We will definitely love Coconut Ice Cream, gotta try your recipe! Another believer :D I hope you enjoy it. Don't forge the toasted coconut!!! so...did i miss it or what? what do you do with the 1/2 cup of the mix that you do not pour in the freezer bowl? it says "pour all except for 1/2 cup into the freezer bowl." i don't see directions for the rest??? Haha, no you didn't miss it. You don't do anything with it...it is extra that would overflown over the standard ice maker so you just take it out and either just freeze it in a cup or get rid of it, that is the conclusion I came to reading the original recipe. If you don't want to waste anything you could certainly do it in two smaller batches!